We have had many different forms of foster care over time, spanning from orphanages, to half-way-esk homes, to the Orphan Trains, to indentured servitude, to group homes, and all the way to families. One thing that has always -- and still -- remains swept under the rug is prevention. 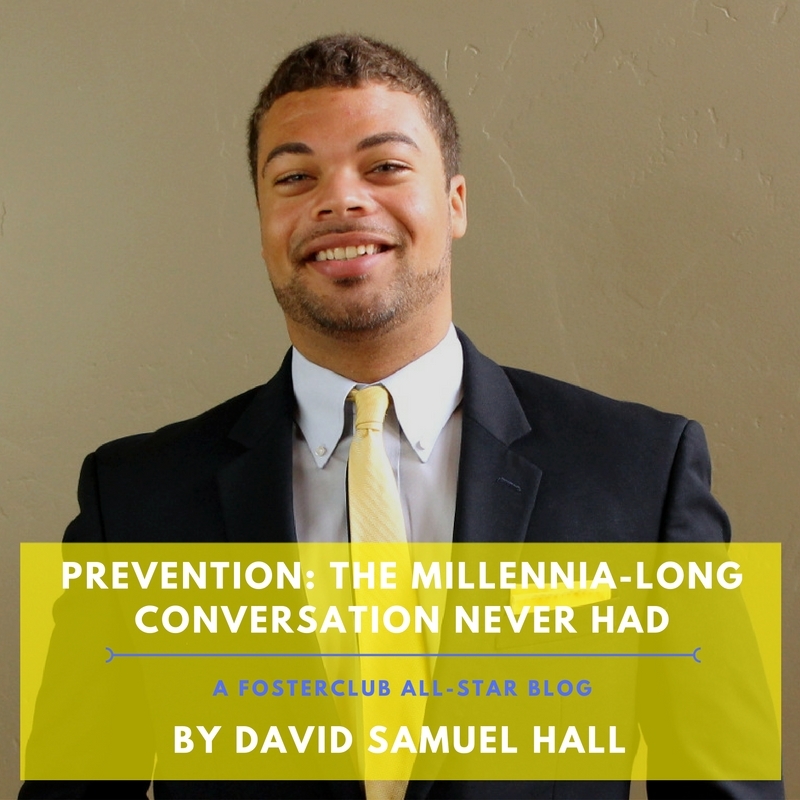 Prevention affected my life almost entirely. I needed to be taken out of my home, but only so that my mother and I could receive proper counseling and wraparound services, along with proper mentorship of my mother in parenting and social development. Unfortunately, all she got was parenting classes, and after being put back with her, it took my detainment of nearly twenty times, two convictions, failing all classes but band (because you can't fail band), and contemplating my own suicide multiple times until going back into foster care where this time she did not even receive a psych evaluation. Some may think my mother had to have done some terrible things- and this is a true statement. Unlike most people though, my mother's issues were of those that allowed her to be thirty points away from a perfect credit score, receive two associate's degrees, and even create Son's Day in place of Father's Day (due to my not having a father), simultaneously abusing me and breaking down doors to prevent my being alone. Had someone addressed these issues and acknowledged part of what she needed were simply friends, then maybe things might have been different- but the disconnect of court and agency led to my troubled childhood when I was in a system that was supposed to help me- twice. This is just my story, however. Is it just a coincidence that when we began the War on Drugs that the prison population increased a proportional rate to that of the foster youth in relation to the child-to-parent ratio? Is it a coincidence that after we brought it back down due to lack of mandatory minimums and losing momentum that we had a spike that in foster care that did not go down until those very same youth's parents got out? Do we think that not allowing a youth to be placed in a shelter while a parent is in jail for three days for a broken tail light or excessive speeding tickets is too much to ask, and instead we should ask that the youth remain in care for the next month until we can get them in court? Do we think that it makes sense to pay $18,000 a kid because their parent is poor (whether they want to work or not) because of our pride when we could pay less for food and housing and even medical in some cases? Does it still make sense when this situation covers literally a third of the youth in care nationally? Do we think it makes sense to never consider utilizing Section 8 housing for youth with dependents at younger ages and forming group homes that are essentially made up of motherhood support groups just because we then have to accept that its an issue? If I am being honest, I hate the fact that I have to be a consultant. Why did I need to have a terrible time in foster care for "the system" to change? How many kids have to die before real change is important? Obviously, we can't say, "zero" because then we are making a promise we know we can't keep. One hundred is far too many. So, let's be pragmatic and find a number that is not too little, but not too much to be a complete and utter disaster because our youth did not even receive child protection services until eight years after we had what amounted animal protection services until a girl walked into a court room with a scar across her face. Prevention is the next step for us. Prevention is the new call to action. Once we receive preventative services for our families, we can begin looking into things like two generational prevention via Job Corps "in-sourcing" to juvenile justice centers and prisons, asking after school programs to begin having events at colleges and partnering with student organizations, and begin reforming our criminal justice system that still allows slavery as a form of punishment which has contributed to potentially 100,000 youth currently in care, and near a million since the War on Drugs. We can be more. I hope we do never have to reach a certain amount of deaths for change in the foster care system for prevention to be important enough for us.